Did December even happen? If it didn’t contain the biggest holiday of the year, it probably would have passed me by without even noticing. A few days after my last post, Evanna’s PICC line (what allowed us to be home while on IV antibiotics) clotted on us and so we had to bring her into clinic. They ended up inserting a PIV (peripheral IV – aka a basic IV) and decided to just admit us for the weekend until our transfer up to Edmonton on Tuesday (December 6) for surgery on December 8th…. which ended up getting bumped to a December 11th transfer (the same day my sister had another baby no less!) and surgery on the 12th. In between all of this, Nick and I quickly drove to Edmonton to attend the Stollery Foundation Gala that we’d been specially invited to attend – where we had a lot of fun and hope to attend in a few years when Evanna is older (as I know the foundation really wanted to see Evanna go). Let’s just say that this particular admission resulted in several setbacks (not including that our surgery was originally slated for November 23rd), and was somewhat exhausting, as we tried to keep a busy little toddler entertained. Given our history, the admission was somewhat a “drop in the bucket”, but man oh man – it sure had its difficulties. Evanna’s improved overall health and stability actually caused several headaches, as not only our surgery but also the hospital transfers kept getting delayed due to more critical cases, and being smack in the middle of RSV season that magnified the situation. On the bright side (cause I’m a “silver-lining kind of gal”), the surgery itself went relatively well – and get this: we were only in ICU for 1 NIGHT!! Yuppers, considering the intensity that every OPEN HEART SURGERY is, this is just incredible and just shows you how far we’ve come. Evanna did lose a fair amount of blood postoperatively and they almost had to take her back to the theatre but it resolved on its own (it’s one of the risks I’ve talked about in regards to repetitive open heart surgeries). The recovery wasn’t the smoothest and it contained some heartache (ie. unable to remove her chest tube until postop day 7 and getting quite fluid overloaded), but once we were transferred back to Calgary, arrangements were quickly made to go home and we were discharged just in time for CHRISTMAS (which was completely unexpected)! It's been an interesting 36 hrs to say the least.... so we had a dressing change on Wednesday that made our already "tough" PICC line nearly impossible to flush anymore. The HPTP/Infectious Disease clinic had us come into the hospital the following morning to assess and try a little TPA (aka a "clot buster"), but despite getting blood back, we still couldn't push stuff through after the first try. So they admitted Evanna last night to insert a PIV to continue with our antibiotic treatment and see if a longer run with TPA would help. Well today it was decided to just pull it (the line site doesn't look that great either), continue using the foot IV and NOT proceed with another PICC line placement. 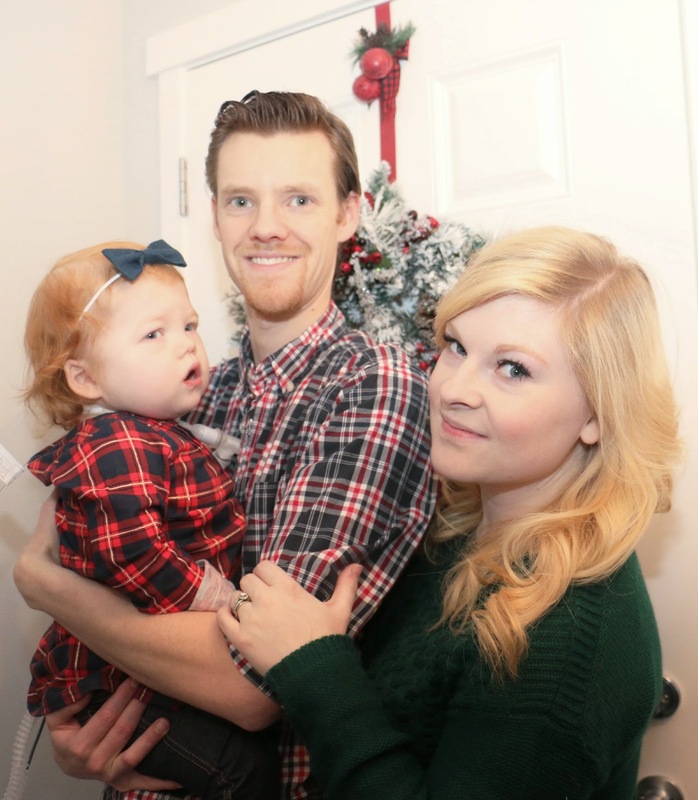 Because Evanna is being transferred to Edmonton on Tuesday for her open heart surgery on Thursday, they decided it was unnecessary to put Evanna under anesthetic twice within such a sort amount of time. Especially when they will be obtaining better access (ie. central line) WHILE she undergoes her surgery next week. So basically we are hanging out in the hospital for the weekend til Tuesday mornings admission. || #edmontonbound || ..... finally. We are going by ground this time, but the team is so desperate to get Evanna up to Edmonton today, that at this point we don't care anymore (there were even talks of "discharging" Evanna, and Nick and I would quickly drive Evanna directly to the Stollery ourselves....but that's another story). 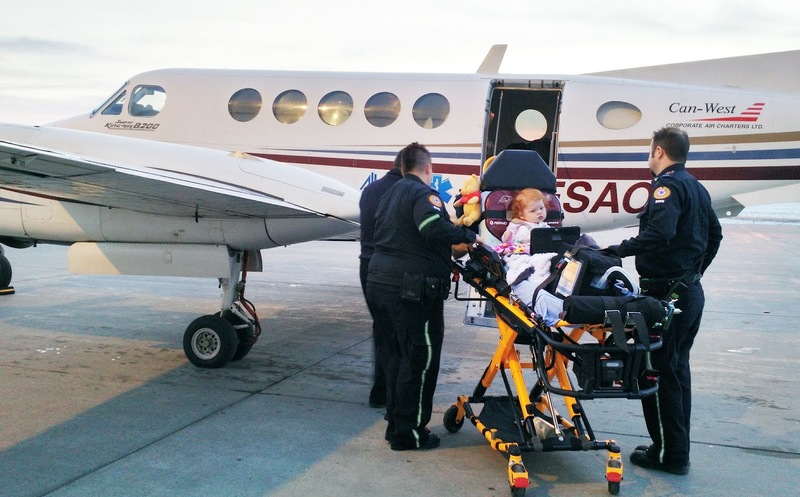 Ohh, and my sister happens to be having a csection today, and LAST time she was in labour almost 2 years ago, Evanna ended up being emergently airlifted to the Stollery at the same time. Apparently Evanna likes to travel to Edmonton on the same day that she gets a new cousin. Our family may be slightly chuckling at this unique and weird coincidence of transfers and deliveries. Evanna was taken back into the OR for her 4th open heart surgery earlier this morning -- making this her 10th surgery to date. She woke up super early and was literally bouncing around all happy as she rode down on the stretcher (which thoroughly entertained the operating room team). While this situation can somewhat feel routine to Nick and I, it honestly gets harder and harder to hand her over to the surgical team for a very invasive and major procedure. The risks become greater and greater everytime they have to "reopen" her, and I definitely found myself getting a lot more emotional and scared this morning then I usually allow myself too. || an update || I initially was going to do a full blog post, but I'll just do a quick update this evening and save the details for tomorrow. 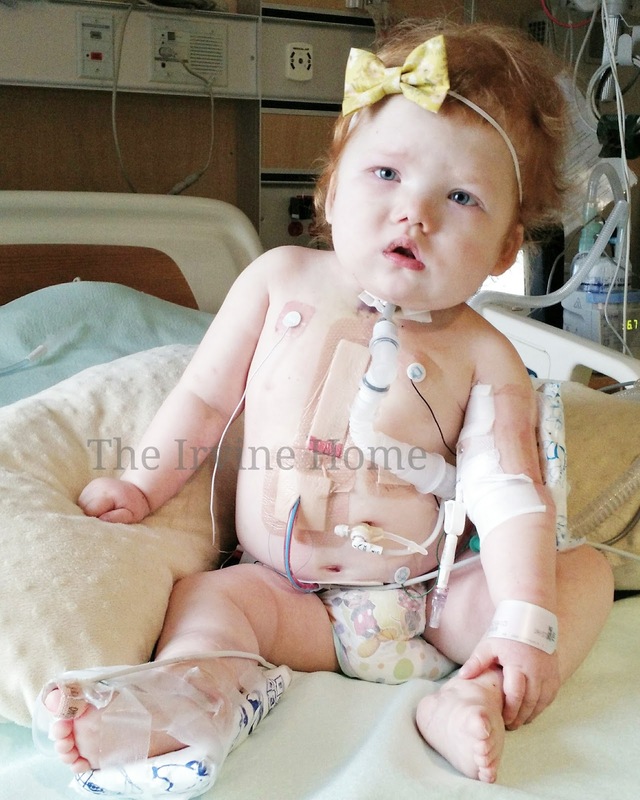 Evanna's open heart surgery went well and the switch out of valves went as planned. 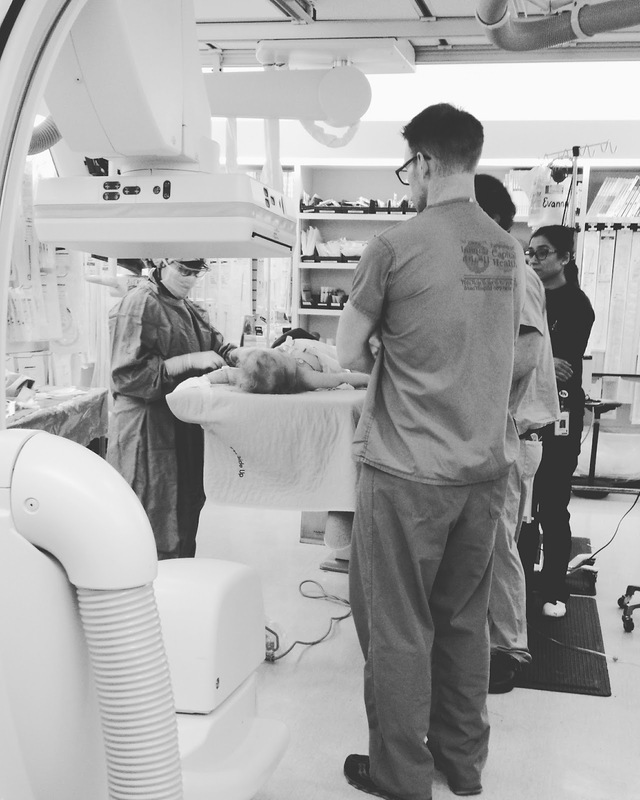 There was a lot of postoperative bleeding back in the PCICU, and they almost took her back to the OR to try and get a better handle on things. Thankfully things calmed down and the rest of the afternoon has been spent trying to keep Evanna nicely sedated (and if we're going to be honest here, definitely a typical Evanna problem lol). If history is any indicator, then I know we'll be in for a rough night -- so continued prayers would be greatly appreciated. || postop day 2 || Evanna had a great night and only required a few additional PRN's (extra doses of sedation medication) to help with the pain. This morning they switched her from the hospital vent over to her trach and home ventilator (essentially what we consider extubation in our family lol). She's down to just one sedation infusion -- hydromorphine, which has also been significantly decreased, and hope to completely flip her over to Advil/Tylenol in the near future. Her central and arterial lines have both been removed and are aiming to have the pacing wires and chest tube out tomorrow (yesterday's blood loss is prompting the team to keep those in for one more day). This afternoon they started her on a little bit of formula/feeds and are hoping to transfer Evanna out of the PCICU and upstairs to the stepdown unit called "ICE" (Intermediate Care Environment) later tonight. Nick and I are somewhat unsure of what we think about this and can't believe how fast this is all happening, but the intensivists are ensuring us that Evanna is doing fantastic and this is "what's suppose to happen". >> that's right, our little girl who endured an almost 11 month ICU stay last year after her first open heart surgery, may make a break for it and transfer out of ICU in less than 48 hours! ------------------------------ This morning we received a very special + precious gift and I even cried while opening it. We got our hands on the new @themaddendelucafoundation monkey that represents one very special little boy who was also born with a special heart. 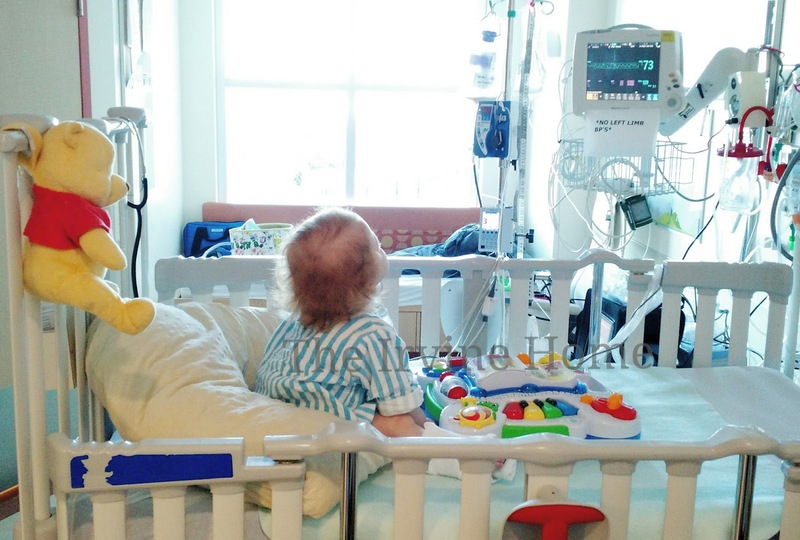 An incredible foundation was created in his honor by his amazing parents, and it has provided so much support to other heart families and now funding some much needed research for congenital heart defects. Be sure to look them up! || postop day 3 || considering all the things we accomplished yesterday, we experienced quite the opposite today with an overall boring day. Evanna was transferred up to the floor last night and we're now in the "ICE room" until we're transferred back to Calgary. Evanna's drainage tube in her chest was still outputting too much blood, so the team decided to hold off another day before taking out her pacing wires and chest tube. This meant we could only decrease her hydromorphine infusion by a smidge, which meant she continued to sleep almost the entire day (which I know is a good thing for recovery purposes...just miss her happy bouncing personality). We've continued to increase her food intake via her GTube, and should be at full feeds by early tomorrow morning – then will see if she'll tolerant bolus feeding after that. Current concerns is the lack of pee + poop, but we've introduced the regular tricks to hopefully move things along (diuretics and laxatives), and we're just hoping we'll see something in the next 12-48hrs. Infectious Disease is also heavily involved to talk about a long term plan moving forward. We will continue on IV ceftazidime and have replaced her oral Cipro (due to neurological side effects that we were starting to experience prior to surgery) with tobramycin...which is also IV, both of which might be ordered for the next 4 wks – which means we could definitely see ourselves spending another Christmas in hospital – but we'll wait til we get back to Calgary before trying to sort that all out. This also means we need to insert another PICC line and they're trying to decide whether we should do that here in Edmonton, or wait til we're back in Calgary. At the moment Evanna's platelet count is low, so it's something they won't do anyways until they see some improvement. || postop day 4 || today Nick left and went back to Calgary – as he returns to work tomorrow morning. While we both welcome the little breaks and know it aids in keeping a healthy relationship (while also paying the bills lol), I still hate loosing my best sidekick during hospital admissions. 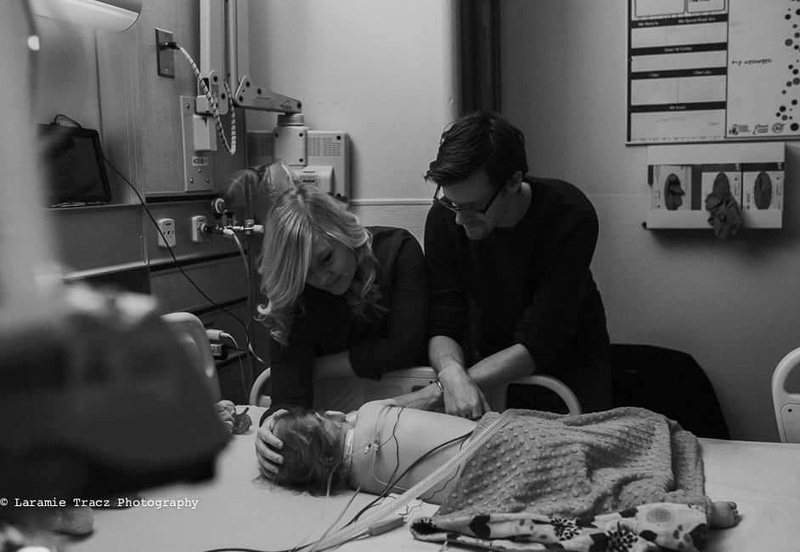 To be honest – while I'm generally the one in charge of and good at advocating, dealing with the doctors and keeping all the medical stuff in order, Nick is better when it comes to being very attentive towards Evanna and caring for all her little needs. I can definitely take care of Evanna just fine on my own, but he's so much better with her, and their bond is so incredibly special. Evanna's chest tube was still outputting too much blood and so we were again unable to take it out today, but we will continue to cross our fingers for tomorrow. We did however reach full feeds this morning and began to bolus feed throughout the day (vs continuous). We've also gotten a little poop + pee earlier this morning, which is a great sign that all her systems are returning to normal and hope we see more as the day unfolds (girl is so puffy). Her platelets have also improved, so they've put in a request for a PICC line insertion for tomorrow – but know there's a possibility that it might not happen til Monday. We're down to just one little IV (which was put in this morning) and so due to incapability with her antibiotics, had to switch her from IV hydromorphine to oral dilaudid – which so far seems to be tolerated just fine. 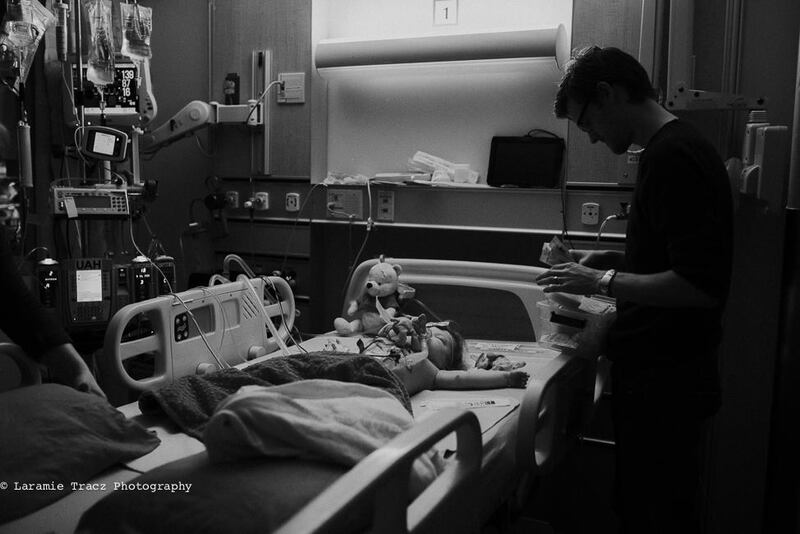 I want to thank Laramie (@laramietraczphotography) for stopping by yesterday to capture this very emotional moment. As you all know, documenting this journey through photos and words has become incredibly important to me over the past 3 years and has become my biggest outlet to process and cope with our situation. 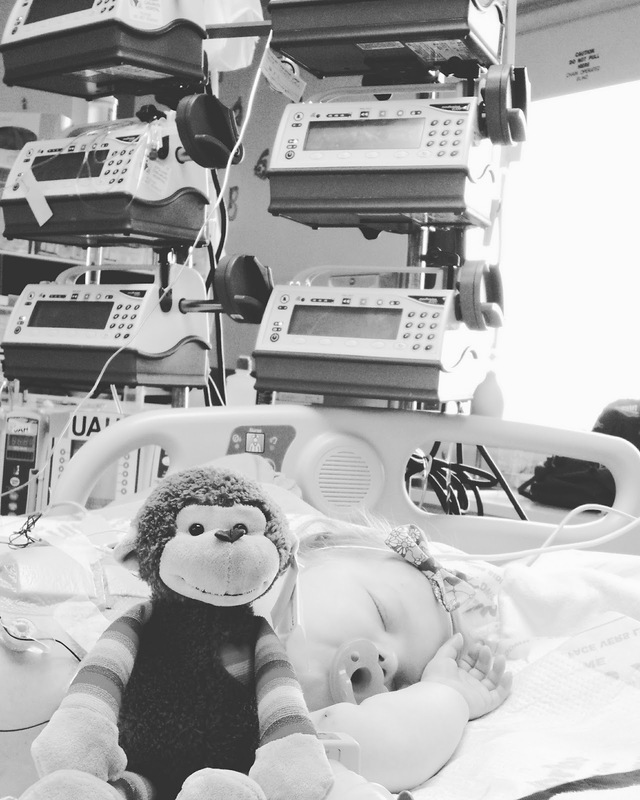 || postop day 5 || it's been a bit of a rollercoaster over the past 24hrs – but overall, Evanna is still doing "well". Things are happening somewhat at a snail's pace, and it's times like this that I miss the PCICU – which has the ability to make changes more frequently and at a much faster rate. I'm trying to remind myself that Evanna is doing fantastic when you take last year into consideration, but it doesn't make the situation much easier at the moment. Evanna's chest tube is still putting out a lot of blood (well, technically it's "serosang") with no signs of slowing down, and so the earliest we think it can be removed won't be til at least Sunday (if not longer....). 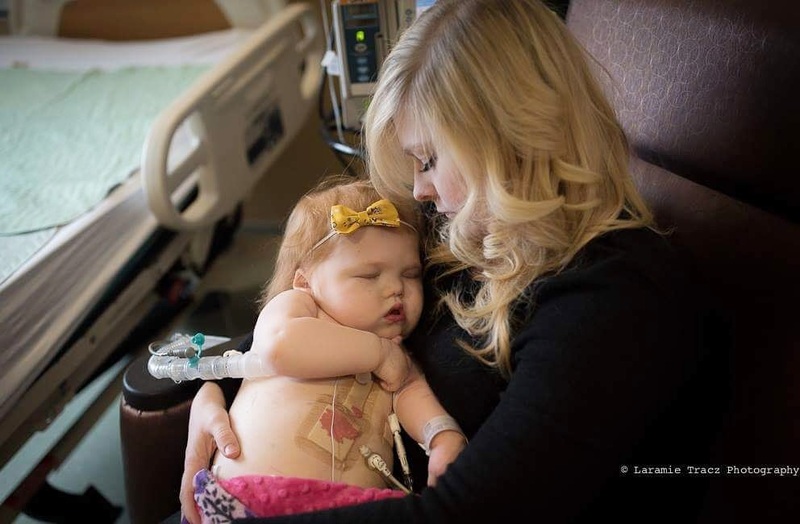 We believe the biggest culprit is how incredibly fluid overloaded Evanna currently is, and so one of the ways for all this fluid to kind of "escape" is through her chest tube (which to be fair, is much better than accumulating in her lungs). Evanna was also quite miserable all day yesterday and into the night (retching and rolling around the bed in some pain), so I had the cardiology resident paged and we came up with a new game plan around midnight. We flipped Evanna from oral to IV lasix (a diuretic) and gave her two suppositories yesterday. Basically we are trying to clear Evanna of poop and move fluid off of her as quickly as possible (though because we're not in ICU, they won't go as quick as this mama would like....). Since then, Evanna has had several bowel movements and 3 good diapers full of pee, so my anxiety level is dropping and I'm starting to calm down as she has been much more settled today. On the plus side, they removed her pacing wires this morning and she got a PICC line just after 4pm, so I feel like we've still had a very productive day despite the chest tube delimma. 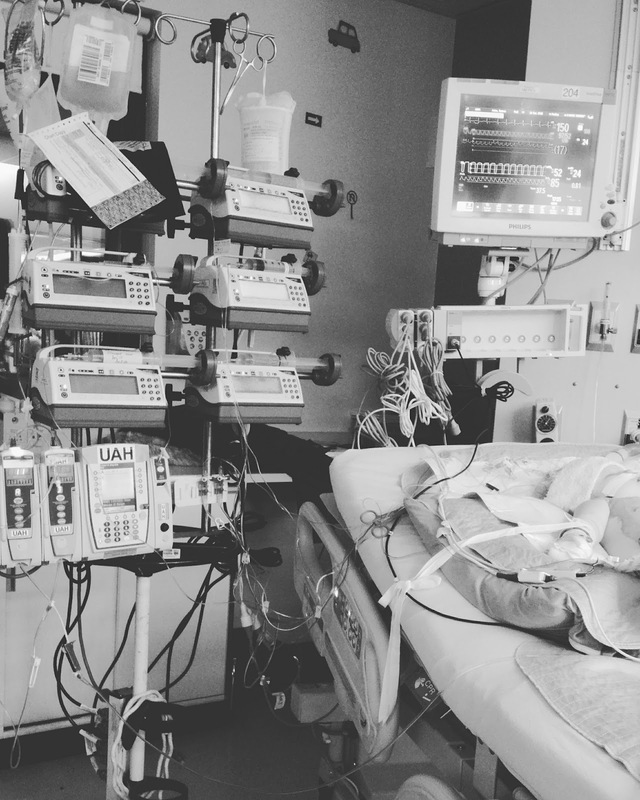 Prayers that we can continue to clear/dry Evanna out (though not too dry, as her heart requires a "fluid preload"), and the chest tube will slow down so the team can safely and successfully take it out. || postop day 6 || look who sat up for a few moments today -- chest tube and all (no smiles...but who could blame her)! Just like the meaning of her name, this girl is one heck of a "young fighter" – the meaning of Evanna's name, and continues to be so incredibly strong and brave. They did a few dressing changes this afternoon (sternal + PICC line), and the nurses couldn't believe how well behaved she was for a toddler – as she lied so patiently and perfectly still during the procedure. This little girl makes me so happy and I'm so proud to be her mom. || postop day 7 || chest tube is finally OUT, and some much needed cuddles were accomplished today. We think Evanna is experiencing some slight withdrawals now that we've discontinued her hydromorphine, so it wasn't all fun and smiles this afternoon like we had hoped for (not to mention the endless linen changes). She's been throwing up all day – but we don't think it'll last long, being she was only on sedation drugs for less than a week. The cardiologist on call this weekend happens to be one of our favorites here in Edmonton (doesn't hurt that her husband is one of our favorite intensivists too! ), and she couldn't believe how amazing Evanna recovered after this surgery -- as she definitely remembers our last open heart surgery and the long hospital admission that followed suit. While assessing her, the cardiologist marveled at Evanna's very content nature and overall calm demeanor (not to mention how big she has gotten) and commended Nick and I on how well we've done as parents. Talks of transfer are starting to happen, and the team has already been communicating with Calgary as we currently aim for Tuesday. We may not be discharged home by Christmas (due to the double IV antibiotic treatment course she'll be on until at least the 26th), but at least we'll be back in Calgary surrounded by family. Thanks again to @laramietraczphotography for returning today to capture a few more moments of this admission. Can't wait to share the rest later! || taking a private jet at sunset -- talk about traveling in style || see you later Edmonton, it's been a slice! It's been a hectic few days, and it all started with our transfer back to Calgary. 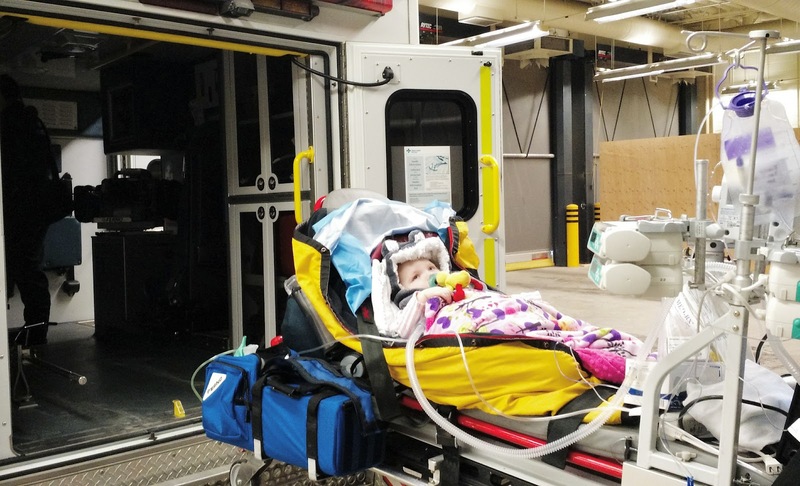 After finally securing a bed at the Alberta Children's Hospital, there was some confusion on how to actually transport Evanna there. It's protocol to always fly patients that are vented, but because she's very stable and the transport team was super busy with more critical patients (tis' the season), it was decided they wouldn't send us with a full crew. Well paramedics are not trained to operate ventilators....so in order for the transport to proceed – I had to accompany her, as I know my way around her Trilogy home vent. Nick was back in Calgary (and sick I might add), but thankfully my parents agreed to drive up to Edmonton that night and retrieve my vehicle for me. We're all settled on Unit 2 and planning our discharge. Edit: I also wanted to add a cute little story. While getting unloaded from the ambulance at the Edmonton airport, one of the flight medics looked at me and asked "are you Nick Irvine's wife!?!" Turns out the flight paramedic used to work in Coronation where Nick was an EMT and is close friends with a very dear friend of ours! Though we were suppose to be admitted until December 27, our awesome medical team pulled some special strings, and arrangements were made so we could be D I S C H A R G E D yesterday! 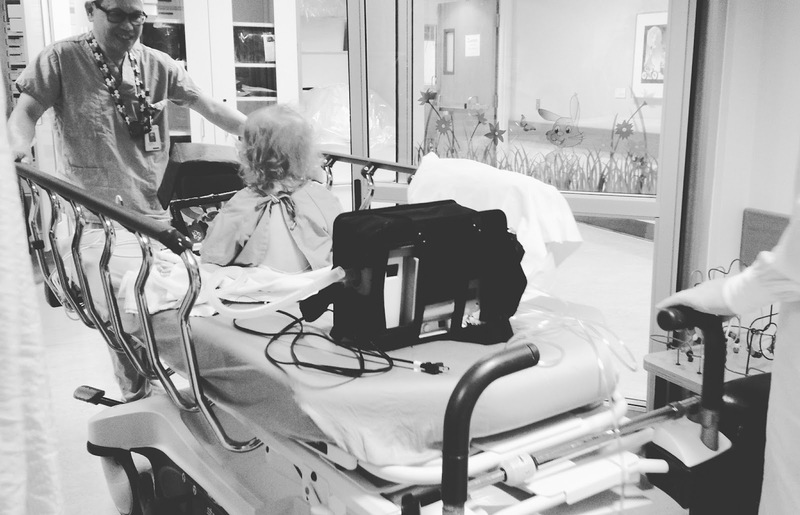 We were fully committed to be in hospital through the holiday weekend – but on Thursday, the nurse practitioner came into our room and asked how we felt about going home early if it could be done. We immediately agreed, and plans were quickly put into motion (so though I didn’t talk about it in my last post, I can’t express how busy we've been trying to get all our ducks in a row in order to pull this off). Because Evanna is on TWO IV antibiotics for another 4 days, they’ve arranged for the HPTP homecare nurses to come out to our house every day and essentially do 2 line changes in order to properly administer the antibiotics she’s on (apparently she was the LAST child they added to the holiday weekend homecare list). Though we didn’t complain about being in hospital during Christmas, we are incredibly grateful that our medical team would go to great lengths to ensure we got to spend Christmas at home as a family (and away from all the icky viruses going around). So much to be grateful this holiday season. **one tiny little and unique coincidence that I didn’t even notice until earlier this week (despite being written in my agenda that I hardly checked while we were admitted) was the day Evanna had her surgery (December 12), also happened to be the marker of “400 days” since our 400 day admission on November 9, 2015. A bittersweet moment for sure! Though we were out of hospital and at HOME for the Christmas holidays, there was only a day or two of relaxation, as things were still quite busy with both personal and social plans (some of which I’ll reveal/talk about in my next post when I do a little 2016 review blog post… so stay tuned!). Just before discharge we were dealing with slightly lower oxygen saturations, but with a fabulous looking ECHO and blood gas (and no other symptoms), we went home and were told to just keep a closer eye on her (which we do anyways lol). Evanna is also on “sternal precautions” until January 23rd, which has been an interesting situation when you have a toddler who is heavier then she looks (a common statement we hear from nurses at the hospital lol) and still not mobile. Essentially we can’t lift her from under her armpits, but from underneath her bum like a newborn instead – so getting her in an out of her cherished exersaucer has been a work of art to say the least! We managed to salvage original Christmas plans with my family on the 24th, and replan things with Nick’s family on Thursday (Nick worked most of Christmas… so dinner had to be slightly delayed). Evanna also had a mini cardiology checkup on Thursday (as we’re just over 2 wks postop, and like I already said, we’re all keeping a closer eye on her). 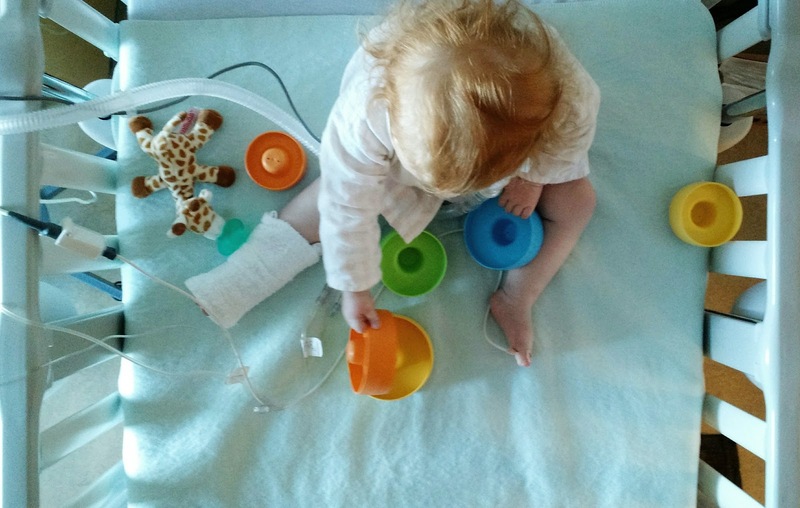 She still has lower oxygen saturations, but Evanna’s iron level is lower than normal, so we believe that’s the reason – which is somewhat to be expected after a major surgery and considering the blood loss she also experienced. Evanna completed her IV antibiotic treatment coarse earlier this week and after seeing Evanna’s cardiologist, Nick took Evanna down to the Infectious Disease/HPTP clinic where they removed her PICC line! Our cardiologist is going to submit the cardiac cath paperwork in January, and we’re aiming to proceed with that procedure sometime at the beginning of February – but as we all know, it will happen when it happens lol. Currently my agenda is starting to populate with all sorts of medical and therapy appointments over the next 6 weeks, but again, I’ll save those details for next weeks’ blog post. Nick and I have made some simple New Year’s plans this weekend followed by hosting a New Year’s Day brunch at our house the next morning (but I still hope to do an official “open house” party when feasible), and are happy to be slowly returning to “our normal”. 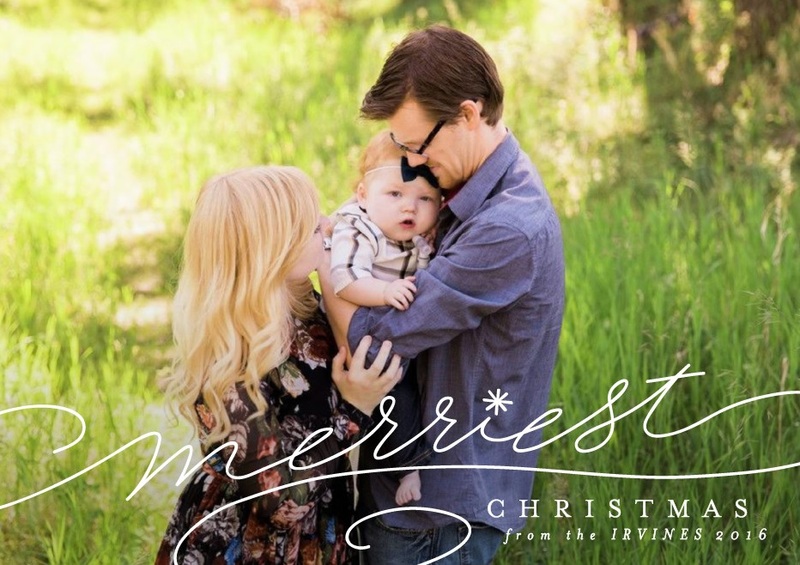 From our family to yours – we hope you all had a great Christmas holiday and all the best in the New Year!